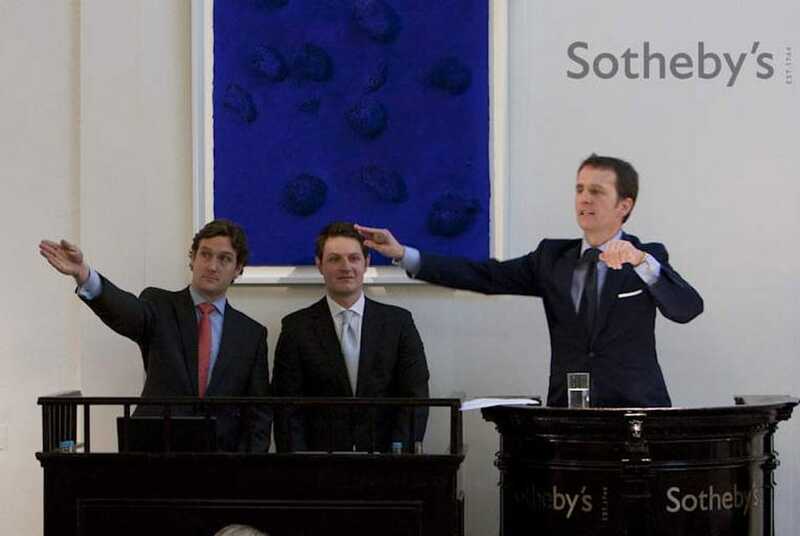 Sotheby’s concluded its ‘Important Watches’ auction on May 14, 2014 in Geneva. Presenting both vintage and modern options, this particular auction offered many collectors a chance to purchase rare and exquisite examples of a variety of luxury watches. The total sale amount, including buyer’s premium, was CHF 10,123,625. Rolex was well represented in this auction, with pieces going for as high as CHF 359,000. One of the most expensive pieces sold at the auction was a Rolex ‘Paul Newman’ Daytona stainless steel chronograph wrist watch, reference 6263/6262. This particular piece was produced around 1972. It features a caliber 727 manual winding movement. The unique dial is known as a ‘panda dial,’ sporting a crisp white dial face topped with black subsidiary dials for 30 minute and 12 hour registers and constant seconds. The case, dial, and movement are all signed. 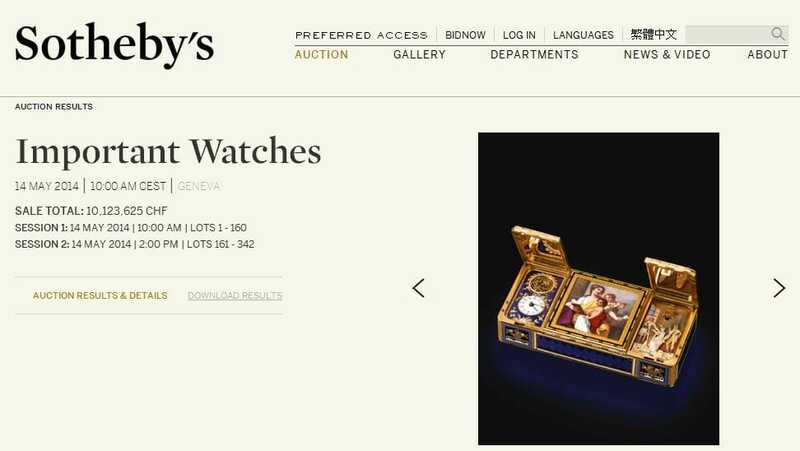 Estimated to sell at a price between 250,000 and 500,000, the watch sold for CHF 359,000. Another expensive and extremely unique piece was a rare yellow gold automatic triple calendar Rolex wristwatch, reference 6062. Sporting the famous “star dial,” this Rolex has a beautiful subsidiary dial showing a fan-form aperture for moon-phases combined with a second hand. Ref. 6062 is one of only two models that Rolex produced with moon-phases. 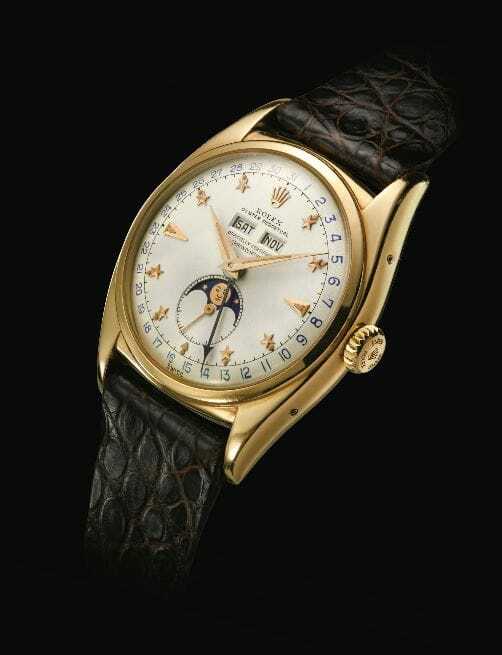 The dial also features number markers as small gold stars, while the minute and hour hands are gold dauphine hands. Thought to go for 80,000 to 160,000, the watch went for a substantially higher amount of CHF 209,000. Several of the Rolex models featured were quite old and vintage. An example would be the 1945 Rolex, reference 3525. Sporting a pink gold case, this chronograph wristwatch is manually winding. The dial is extremely unique, featuring applied Arabic and baton indexes, engine-turned subsidiary dials for constant seconds and 30-minute register, and outer minute and second track. The dial is very busy, featuring many of the markings normally placed on the bezel. 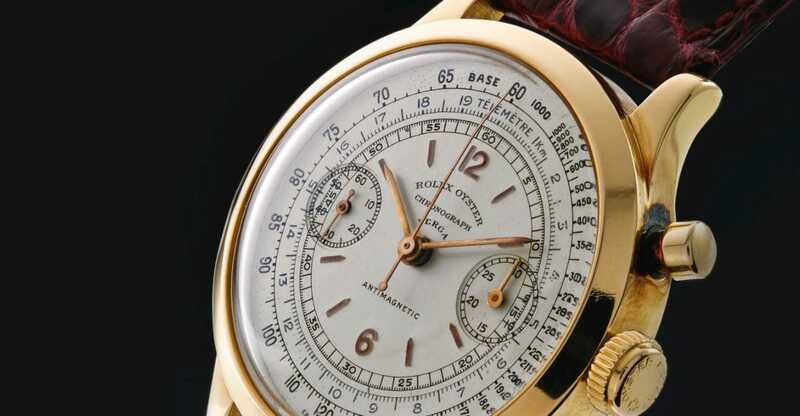 Thought to sell between 70,000 and 100,000, this stunning watch went higher, selling for CHF 185,000. 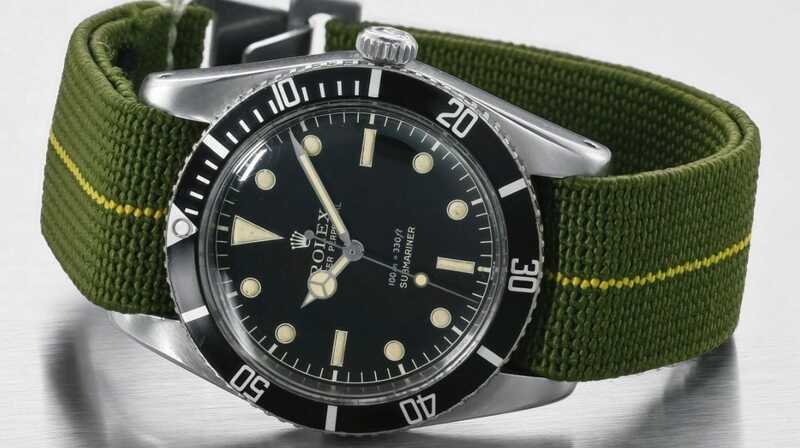 One of the most interesting finds at the Sotheby’s auction is the Rolex diver’s watch, reference 5508, featuring a green bracelet. Made around 1962, this unique piece utilizes caliber 1530 automatic nickel lever movement. It is thought to have been originally used by the French Marine Nationale. This extremely rare piece was originally estimated to sell between 30,000 and 50,000. However, this lot went way beyond the estimated price, selling for CHF 155,000. Though some lots went unsold, the majority of items up for auction went quickly, and, for many, at higher than estimated prices. Auctions like this are an excellent way for collectors to not only learn about the many rare and beautiful luxury watches in the market, but to also acquire unique and meaningful pieces for their own collections.